It's been seven days since my experiencing my favorite holiday for the first time as a father. How did it go? Well, we packed in so much over the holiday weekend that the amazing meal and experience of Thanksgiving is almost a blur....I did say almost. Our almost 7 month old was a trooper through the entire event. Earlier in the week she had her 6 month well visit at the pediatrician who gave us the go ahead to try new solid foods. This was exciting because that meant we could sneak some turkey into her planned meal of sweet potatoes. I will tell you this, since we started solid food a few weeks ago we have yet to find a combination or concoction that she will not eat. To her the sweet potatoes and turkey were just another chance to try something new. Relative to her size she probably ate as much as we did on Thanksgiving. Her festive meal was a success, and it helped accomplish something for me as well. 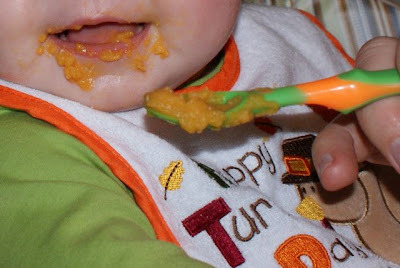 Every previous Thanksgiving, I'd stuff myself until I could barely stand up from the table and I had big plans to make this Thanksgiving as good or better than all the rest and the baby helped me succeed. You see, I think part of the reason I get so uncomfortably stuffed is because I eat too fast. Having a baby at the table as eager to eat as I was sort of takes priority to my own gluttony. Thus, I was able to eat as much or more than previous years much more slowly, and a lot less uncomfortably. It was our first major holiday as parents and it was fun. We took a lot of pictures, laughed at her messy face, and spent time with our family...I can't wait until Christmas! Congrats, we still can't get our 3 year old to eat anything without having a "taste test" first...no joke...SIGH! Our little man eats everything on earth too. Glad you had a fun first Thanksgiving.